Since there are a lot of new people following me, I thought I would give a little overview of every thing. I am 15 years old, I will be 16 on October 19th. 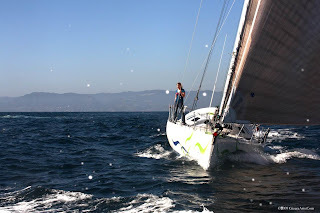 I am planning to sail around the world solo non–stop and unassisted and to set the record as the youngest ever to do so. This trip has been a dream of mine since I was thirteen. We are getting very close to having everything fall into place to make it all happen, but as close as we are, we still don’t have enough funding to buy the boat. Although I didn’t start planning things very seriously until recently, preparations have been progressing amazingly fast. It has been quite exciting since our first press release went out. Our first major sponsor, Shoe City , came on board immediately after the first press release. We are at the point where the next step is to buy the open 40 in the Bahamas that we have decided on. The problem with that is we cant buy the boat right now due to funding. If we don’t find another major sponsor soon the whole trip could fall apart, which would be awful after all the hard work and time every one has put into it. Happily, Kauffman Sports Management Group has come on board to deal with any potential sponsors. Please contact Matt Tolnick at Kauffman Sports Management Group (310-456-5400) for more information. With where I’m going, timing is very important. I will need to train on the boat for as long as possible before leaving. We won't purchase the boat until the trip is completely funded so timing right now is key. We had a good sail yesterday with one of my dads friends, Peter Kokelar, Lisa Gizara the photographer. 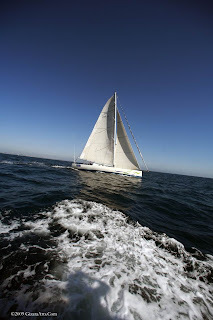 It was a lot of fun and Lisa (GizaraArts.Com) has got some great photos of the different boats I have been training. I can’t wait for the week end. I’m going to be going out on an Open 50. It’s the most amazing boat I have ever been on! We have all been really busy over here lately. My dad and I and a few other people went out to Newport, Rhode Island last week to look at an Open 40. The boat was great, but it needed more work than we have time or money to do. My dad is flying out to Nassau, Bahamas this evening to look at another Open 40. The one he’s going to see looks like it might work. I have been sailing on a friend’s Open 50 a lot recently. 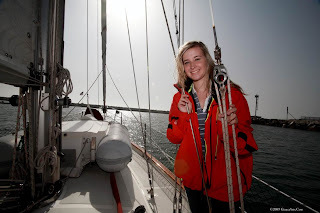 I love the boat, and I don’t think I’ll ever be able to go back to sailing normal cruising boats! Hopefully, we’ll be able to buy a boat soon. I am really looking forward to begin working on the boat that will take me around the world. Shoe City has come on board as a major sponsor. This will allow us to buy my boat and get it over here so I can begin working in earnest on knowing the boat inside and out Shoe City have been really great to work with, and thanks to them, things are really getting going. We are still looking for more sponsorships. If anyone is interested, they can contact my dad, Laurence, at Laurence@sunyachts.net. A lot of people have been asking me about Laura Dekker recently, so I thought I’d just let you know my opinion. Age doesn’t matter. She and her dad think she’s ready to go and they are the only two people that should be able to make the decision of whether or not she does. 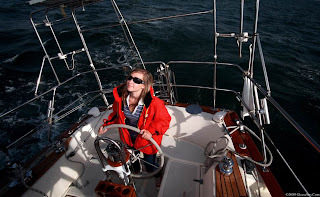 I dont know her, but, she has proved that she is a very capable sailor and I hope that she is able to go. I’ll be back with an update on Dad’s visit to Nassau as soon as I know anything.